As Defiance’s only Master IJO Jeweler, we travel to Antwerp, Belgium, the Diamond Capital of the World where more than 80% of the world’s diamonds are cut, polished and sold, to procure diamonds directly from De Beers sightholders. Pre-sales are available to our customers two months before each trip. We travel more than 6,000 miles to hand-select a specific diamond for you from among the largest selection of diamonds in the world. Belgium is known for three things: diamonds, chocolate and beer. Stop in and let’s discuss the diamond of her dreams over an ice-cold Belgian beer and upon our return, enjoy an added sweet treat, Belgian Chocolate. Once in Antwerp, we are your personal diamond shopper. We sort, sift and grade thousands of diamonds, picking only the best of the best – before the rest of the world ever gets to see them. We search for diamonds based on your specific criteria and price points. No order is too small or too large, and no special request is beyond the reach of our Antwerp suppliers. Why are Antwerp Diamonds so special? 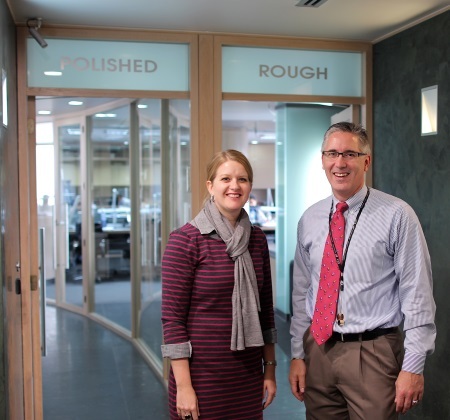 Jewelers often talk about specifications certification and the “Four C’s” and indeed, these are very important. But diamonds are so much more than that. Diamonds are a symbol of love and romance. In Antwerp, we search for diamonds of exceptional beauty. Specifications such as cut, color and clarity are simply a starting point. Since no two diamonds are alike, diamonds with the same certifications can differ dramatically in appearance. 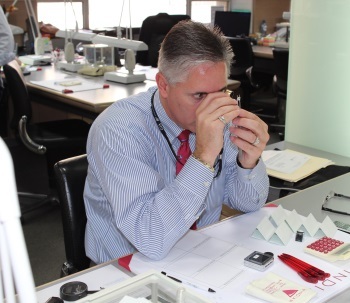 We take pride in spending hours examining diamond parcels in search of the perfect diamond, just for you. Being a jeweler is about sharing special moments with our customers. We love that. We get caught up in your lives and your stories and we love being a part of making your dreams come true. That is the Antwerp experience, for us and for you.